Over the past week, the Jets have made the news for various items. I have already talked about Bart Scott making an appearance on this Thursday’s TNA Impact, which airs at 9 PM on Spike TV. Now, the Jets have two other items that people have been talking about. The Jets announced a 2.3% increase on all PSL seats. They also announced for front office staff they have to take non paid week long furloughs once a month during the lockout. Even with the season over and the CBA looming this week, the Jets still know how to make the headlines. There will be a 2.3% average increase in ticket prices at New Meadowlands Stadium for the 2011 season. Upper level seat prices will remain the same. I am sure those ticket holders are breathing a sigh of relief. The cost of all seats with a PSL will increase by $5. If there is a shortened season, the effect will not be as bad. Season-ticket holders will be required to pay only 50% of their season tickets & parking by April 1; full payment was due by that date last year. The remaining portion won’t be due until the league announces the date that training camps will open. Season-ticket holders will also have a six-month payment plan option. I applaud the Jets for doing this. They finally woke up and understand people may not be able to flip the entire bill by April 1st. They should have started payment plans years ago. In the case of a lockout, season-ticket holders will be refunded a proportional amount if preseason or regular-season games are lost. PSL payments won’t be affected by a lockout. So no matter what, fans still need to hand over their money to help pay for the stadium, and their new renovations. “While we have every reason to believe that the season will go forward as planned, we’ve adjusted our ticket policies to reflect this period of uncertainty,” said Matt Higgins, executive vice president of business operations. The Jets will also work in conjunction with Mark Lamping, the CEO of the New Meadowlands Stadium Company, to provide more shelter from rain in the upper level end zone concourses and add 40% more capacity in the mens restrooms in the upper level. I interviewed fans who thought this move should have been done. Fan favorite Woody Johnson toured the upper level concourse in the rain toward the end of the regular season before determining that more shelter from the inclement weather was needed. The Jets played more than half their home games in the rain. Matt Higgins also said “In the first year of any new stadium, you have a chance to evaluate what worked right and then where you can improve. “There’s always room for improvement. We had a few issues that we’re going to address in the off-season to improve the experience in the upper bowl.” Fans during the season expressed a lot of changes that needed to be made. It seems the Jets have listened to some of them. The Jets also reduced orange level parking prices for season-ticket holders from $25 to $15. The orange parking is the NON PSL parking. Fans can also upgrade parking levels from orange to yellow on a first-come, first-serve basis. Many wanted to do this, seeing the yellow was closer and better areas to tailgate in. There was only one orange parking section in close proximity to the stadium. The rest was by the Izod Center. Many fans have e mailed me saying they saw some kind of increase coming. 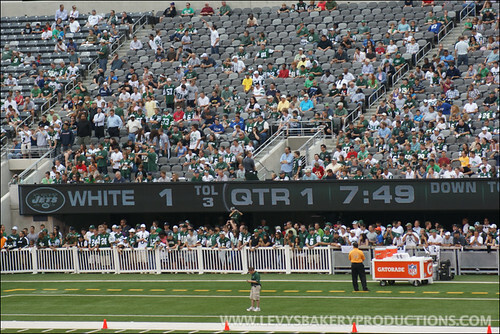 With no stadium sponsor the Jets and Giants need to generate extra revenue. They may claim rising costs and overhead or economy issues, but with no stadium named after a big company, there is money that needs to be made. If there is a full season, one seat will be $40 higher. There is part of one parking pass or a 1/4 tank of gas right now. On top of that the team announced that business-side employees will be asked to take a one-week per month furlough during the lockout. “While we have every reason to believe that the season will go on as planned, it makes sense to adjust our policies to reflect that uncertainty around exactly when an agreement will be reached,” said Matt Higgins said, per the NY Daily News. The effects of the lockout could prove catastrophic for some employees. News of the proposed furlough came on the same day the team announced a blanket 2.3 percent increase on all season tickets in 2011. This could backfire on the Jets. Some employees might have to seek other employment. This is not the kind of economy where not being paid one week a month would sit well with many. Others might try to stick it out, seeing they work for an NFL franchise. So the Jets try to cut costs in their organization and raise prices for fans to pay more for tickets. Shouldn’t the Jets be the ones to pay more and try to save money for the fans? I know there will be some kind of evidence where the Jets have said or will try to make sure fans pay less for something. Not just on non PSL parking, but for everyone? Now the payment plans and paying for only games played is a great business decision. But there should be at least one season where the fans do not have to see prices go up on them. Just once. Bart Scott sounded like a pro wrestler during some of his playoff interviews. He now gets to try the real thing. The New York Jets linebacker will have the chance to rant and rave for an actual grappling company. Bart Scott has signed for a March 3 appearance with TNA Wrestling. Scott arrived Thursday in Fayetteville, N.C., to tape interviews for “TNA Impact,” which airs at 9 p.m. Thursdays on Spike TV. Scott’s NFL contract will likely prohibit him from engaging in much — if any — physical activity. But just being involved will allow Scott to fulfill a lifelong dream. Scott is a die-hard pro wrestling fan who counts Hulk Hogan among his all-time favorites. The duo will be working together in some capacity on Impact, a source in TNA said. The 57-year-old Hogan will be returning to TNA television March 3 after an extensive hiatus following major back surgery. The Hulkster positively critiqued a spirited postgame interview Scott did after New York’s second-round playoff upset of the New England Patriots. TNA has used current and former NFL players like Adam “Pacman” Jones and Frank Wycheck in previous storylines. TNA also made a standing offer last month to Cincinnati Bengals wide receiver Chad Ochocinco and head coach Marvin Lewis after the former sent a tongue-in-cheek Twitter message claiming he wanted a steel-cage match so the two could settle their differences. The bout, which neither has accepted, would be held April 17 on TNA’s “Lockdown” pay-per-view show emanating from Cincinnati. Scott isn’t the only non-wrestling personality TNA has added. Former “Jersey Shore” cast member Angelina Pivarnick will be appearing on the March 3 and 10 episodes of “TNA Impact.” She will be joining forces with TNA’s “Jersey Shore” knockoffs Robbie E. and Cookie and issuing an open challenge to former castmate Jenni “J-Woww” Farley. NFL vS NFLPA: Are The Fans On The Losing End? Well, the dust has finally settled after another Jets season. Many fans not looking forward to the 6 month off season before preseason begins. The players and rookies will be called to camp before then, but not soon enough for some. Counting down days on the calendar like prisoners waiting for parole. I hate when football season is over. I am not into basketball. Hockey begins close to the playoffs. Baseball begins for me at the All Star break. Football is my true sports vice. With the 2011 season still up in the air, many fans wonder if they will be able to use their season tickets. Some others are wondering if it is worth even looking into the ones that are left. With the NFL and NFLPA not close to agreeing on a new collective bargaining agreement the 2011 seems like a season of fantasy. The NFL and players both have their terms they would like to be met. In the end, if no terms are met, not only will the NFL and players both lose money but the fans will lose out as well. Many fans only paid one year into their five or fifteen year payment plan of their PSL’s. If there is no season, one still has to make that payment. But the Jets did say payment on season tickets would vary. If there is no season, no ticket money would be paid. If any games are played, then payments for only those games played. With the football season only having 8 home games, a shortened season is close to having no season. Especially to tailgaters. I wonder just how often when the big decisions are being made in these meetings with team owners,, the NFL, and players that the fans are taken into consideration and discussed. The fans are like the last ones picked in the game of kickball. Is there a discussion on how all the decisions will affect their fans or is it about how they will lose out on generating revenue. In reality, the fans are the ones who help them generate that revenue, not just sponsors,TV contracts, merchandising, etc. I am sure the NFL and team owners know this, but is there a focus that is really put on the fans who come out and pay? I may be venting a little bit here. I know the NFL and teams do think about the fans. But I am sure they think more about the ticket sales and making sure seats are filled rather than who actually sits in those seats. They could care less if Joe SuperFan who has been sitting in the same seat is there, as long as that seat is filled. To them, Joe SuperFan is just a consumer. They do not care if he comes to every game, they do not know him personally. As long as his seat is paid for, that is all that matters. But i am sure they know the VIP’s and those who purchase suites by name. Those people get different sales reps who know their clients by name. 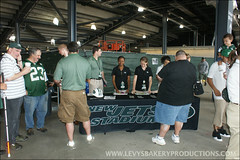 The sales reps for stadium seats wear Jets polo shirts. The sales reps for suites wear suits. I know, I followed a suite sales rep around as he was pitching a suite to a potential customer. I heard their conversation. It is such a different approach than the average fan looking into seats. The suite sales rep mentioned how he would be treated the same way Woody Johnson would be treated. Shouldn’t every fan be treated the same way? Or only those that pay more than others? In this off season, a lot needs to be taken into consideration as to how the NFL, team owners, players, and fans should be considered. For the last three seasons, I have interviewed many different Jets season ticket holders. I have received opinions on various levels. Many fans feel that even though they are talked to on varying degrees, their opinions do not really matter. Even after the new stadium was built and was supposed to be better for all fans, complaints are still rampant. Only the ones who follow the Jets like sheep and do everything they say do not complain. In this off season many factors need to be considered. The NFL and NFLPA not only should come to an agreement for what is best for both sides, but do it before the start of the 2011 season. if they don’t, many fans will be outraged and angry. 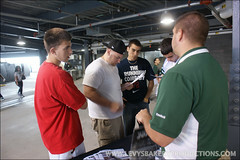 Jet fans want the 2011 season to happen. Even if the Jets do not keep the same team from this past season, the aura is there to make another worthy run into the playoffs next season. No one wants to see a lock out, no one. Not the teams, the players, the NFL, anyone. I think the NFL and fans should have a collective bargaining agreement. The fans should ask for certain universal concessions from the teams to make sure we actually get our monies worth. Every fan has complaints about their team. I do not think any fan is 100% satisfied with everything. From the team to the concessions to the parking, everyone has at least one issue. So as the NFL and NFLPA sit in their meetings for hours on end, they should keep one thing in mind. Are the decisions we make not just right for us, are they right for our fans. The past two weeks I have not been as excited for the Super Bowl I guess as I should be. Even a fellow fan John Allen passed along the same comment. He was thinking that for some reason his favorite team should be playing this past Sunday, but for some reason, they ended up losing to the Steelers in the AFC Championship game. The Green Bay Packers defeated the Pittsburgh Steelers 31-25 in Super Bowl XLV on Sunday night. Aaron Rodgers won his first Super Bowl and it is tough to believe he can’t win another. The Steelers jumped out to a quick 24-0 lead over the New York Jets in the AFC Championship, but fell behind a quick 21-3 to the Packers on Sunday night. At the end of the night, Clay Matthews was throwing a WWE championship belt over Rodgers’ shoulder. Ric Flair is taking credit for having the WWE send the belt to him, as told to ESPN, to use if they won the Super Bowl. How do us Jets fans feel now? No one can really say what the result would have been on Sunday night had the Jets been playing in the Steelers’ place. Jet fans may feel like they definitely would have won the game, but again, we cannot say for sure. It’s hard not to feel disappointed these last few nights. One never know what their team would do if they were never in that situation. The Super Bowl was right there; it was in our grasp. The Canyon of Heroes was ready for the parade that should have been filled with streamers and fans jammed in to see Gang Green. Everything was going as planned, just for it all to come crashing down. Just imagine: Rex Ryan could have been saying “I told you all we were going to do it, AND WE DID IT!” on that podium Sunday night standing next to owner Woody Johnson, GM Mike Tannenbaum and Mark Sanchez. Bart Scott could have been having another postgame interview that would go viral on the Internet. “WORTH THE WAIT,” he could be yelling in Sal Paolantonio’s face. Santonio Holmes, Braylon Edwards and Jerricho Cotchery could be running all over Cowboys Stadium with their arms outstretched like airplanes while wearing their “New York Jets Super Bowl Champions” caps and t-shirts. Nick Mangold and Dustin Keller could be racing to their cell phones to be the first Jets to tweet about the win. Antonio Cromartie’s kids could be dogpiling him in the end zone. Shaun Ellis would then join the team on the podium to get his fingerprints on his Lombardi Trophy and press his lips against its mirror-like surface. He has waited long enough to get his hands on that trophy after being with the team the longest. To me Super Bowl Sunday was just another day of football. I did not put on my Jets jersey. No Jets shirt or hat to be worn. Not even my trusty Jets boxers I wore every Sunday the team played. Two teams were playing that were not my team. The Jets were deserving of a Super Bowl this season. Anyone who is not a Jets fan will instantly contest this, because everyone else HATES the Jets. I can’t blame them. The Jets have a bunch of big mouths and a coach who has no filter. But the fans take on the personality of the team, and I can safely say we had a lot more fun than many others did. Even the Jet fans who are haters enjoyed themselves this season. Gang Green fought through all the criticism this season. After a bunch of close games that should not have been close and after some bad losses, the Jets showed everyone who they really are in the playoffs. It does not matter how you finish the season, it is how you finish in the playoffs. They took down Peyton Manning after he made them look bad in last year’s postseason. They took down the Patriots who were already being crowned champions. They forgot to show up for the first half against the Steelers, but almost pulled off one of the greatest playoff comebacks in history. I am not trying to take anything away from the Packers or the Steelers by saying this. Both were much more deserving of a championship after the way they have played in the playoffs. Just because the Jets were a worthy candidate does not mean other teams were any less deserving. Things get even harder knowing there might be a lockout on the horizon. Knowing that there is a possibility the Jets will not get a chance to play in the Super Bowl in 2012, nor will any other team, is a tough reality to face. I could go on about this, but all football fans are feeling the same way about this except maybe Packers fans that have the privilege of enjoying a championship for two years if there is a strike, but I am sure even they would rather lose than not have football. Knowing that we will all be at least a year older before the Jets get another shot at a Super Bowl run is a feeling that I have felt time and time again. I have always hated the offseason because of how long I have to wait for Week 1. I hate the offseason because of how long I have to wait for the AFC Championship. Again, no guarantees that they will make it again, but it’s tough to feel like the Jets would fall short again. It seems as Jets fans we are always waiting. Always waiting until next season hoping that will be the season the Jets win it all. If there is no next season, we just have to wait longer. Easier said than done. 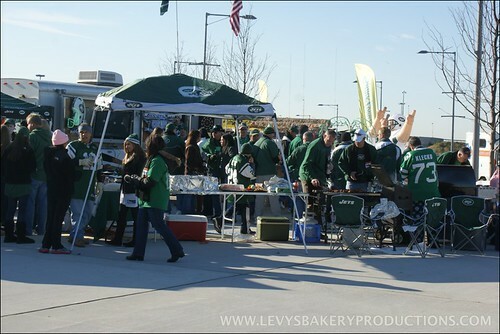 Levy’s Bakery Productions was formed in August of 2008 before filming the documentary Gang Greed. Levy’s Bakery Productions is named after my grandparents bakery in Belmar, NJ. It stood on Avenue F but has been gone for decades.